STATE COLLEGE, Pa. (AP) — Lamar Stevens pumped his arms, pointed with two fingers to the Bryce Jordan Center hardwood and screamed toward Penn State’s student section. This is his court. Penn State’s rangy forward owned it Tuesday night, then shared it with hundreds of fans who rushed Stevens and his teammates after Penn State upset No. 6 Michigan 75-69. Stevens scored 15 of his 26 points in the first half and grabbed 12 rebounds to pace the Nittany Lions (9-15, 2-11 Big Ten) who led for all but 3:15. His physical play on the defensive end helped hold the conference-leading Wolverines (22-3, 11-3) to just 27 points in the first half. Penn State pulled away over the first 20 minutes as its star heated up and Michigan played the second half without its coach. 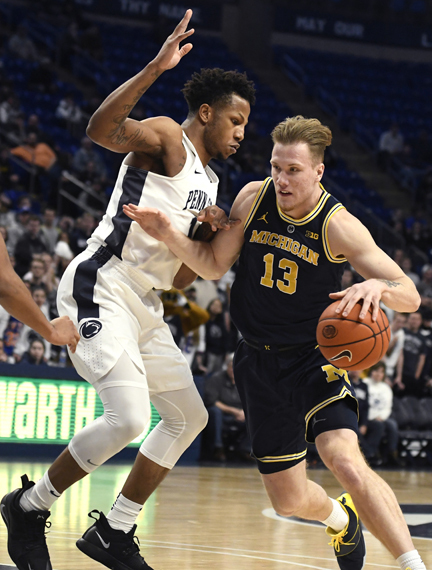 Michigan coach John Beilein received back-to-back technical fouls and was ejected for arguing with officials as the teams entered the locker rooms after the first half. By that point, Stevens had potted 10 points during an 18-9 run that made it 40-27 at halftime. The rangy forward came up big on the other end of the floor as well. He blocked Poole’s layup try then came up with a rebound on another Michigan miss seconds later to foil the Wolverines’ final first-half possession. Myles Dread chipped in 17 points, hitting five 3-pointers, for the Nittany Lions. The win snapped Penn State’s eight-game skid against Michigan. Charles Matthews scored 24 points and Jordan Poole added 17 for the Wolverines, who never led after the first 2:24. Meanwhile, the Nittany Lions led by as many as 12 with 1:27 to play. Michigan pulled within four on Jordan Poole’s 3-pointer with 18 seconds left, but Stevens went 2-for-4 from the free throw line to keep the game out of reach.